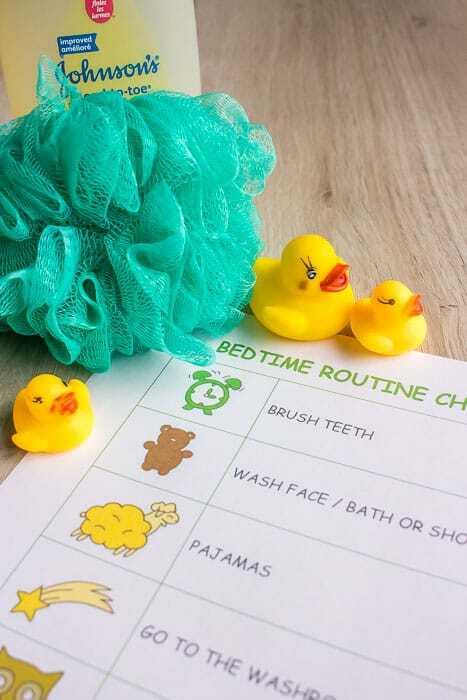 This simple bedtime routine chart is the perfect way to organize your child’s evening. We try hard to keep our kids’ bedtime routine as simple as possible. At one point, when our kids were little, our bedtime routine turned into a two hour marathon. We would start with picking up toys, taking a leisurely bath, brushing teeth, putting on pajamas, putting dirty clothes in the laundry, and reading a book (or ten!). By the time we were done our routine at lights out, the kids were honestly hungry for a snack, so we added a little bedtime snack, and finally lights out. Some nights this took a couple of hours! It wasn’t working for the kids, and it sure wasn’t working for us. Instead, we created a simple bedtime routine that we do every night, and that takes us a maximum of 30 minutes. We’ve used this routine since our youngest was a baby, and it’s still working now that she’s nine! Love printables? Check out this adorable Easter Egg dot maker printable! 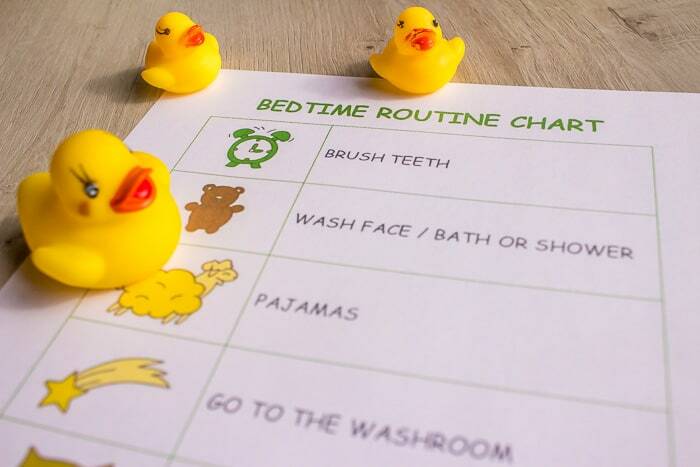 This cute, free printable bedtime routine chart is easy to print out and use for your child’s bedtime. The best bedtime routine is the one that works for your family! You may want to add or remove steps, depending on your family’s needs. You can download the routine chart in Microsoft Word format, and change it as much as you want! Click here to download in Microsoft Word. You can even print it out, laminate the chart, and get your kids to cross things off with an erasable marker! Here’s our routine: Brush Teeth – Wash Face – Pajamas – Go To the Toilet – Read – Lights Out. That’s it! 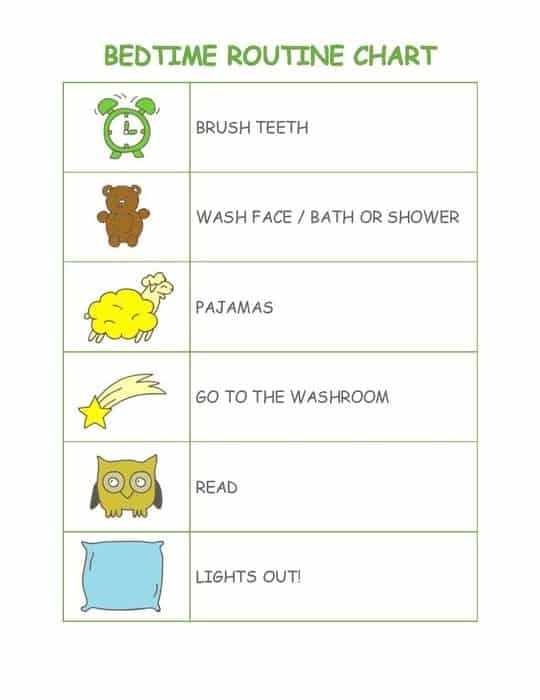 The whole bedtime routine of Brush Teeth – Wash Face – Pajamas – Go To the Toilet – Read – Lights Out takes us about 30 minutes. 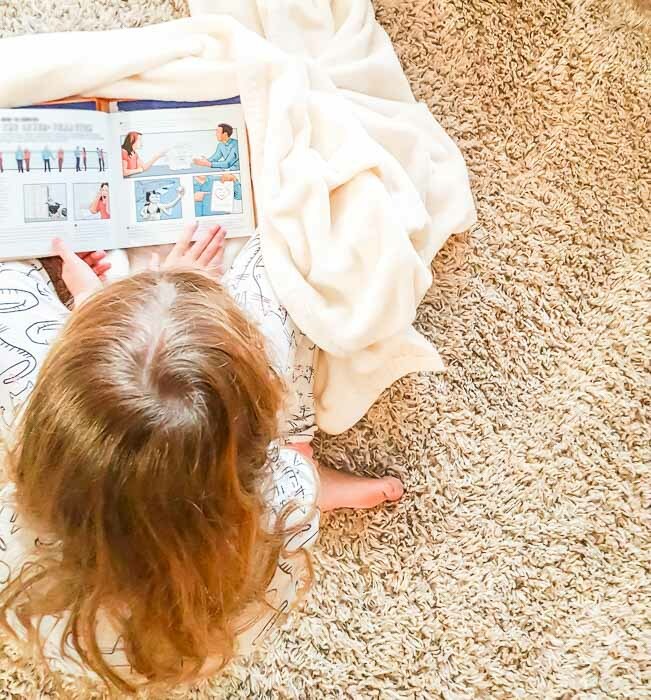 It can take as little as 15 minutes if there’s only a page or two of reading, and as long as an hour if the kids have a long soak in the tub, and take a bit of time reading. This is our first rule of bedtime: no screens for one hour (or more) before bedtime. We’ve found that when our kids are allowed to use their iPad or play games close to their bedtime, they’re more excitable, don’t listen as well, and don’t settle down to sleep. Aside from our experience, there’s also some pretty good evidence that the blue light emitted from screens disrupts sleep. We do let our kids use an e-reader that doesn’t have a backlight before sleep, as that doesn’t seem to disturb their sleep. Full disclosure here: the kids don’t have a bath every night. It’s honestly just takes too much time on weekend nights, so we often fit in a bath or shower after school, and in the afternoon on the weekends. Besides, the pool counts as a bath right? If I’m honest, we’ve even counted running through the sprinklers on a hot summer day as shower time, too. From the time they were little, we’ve used JOHNSON’S® Baby products for our kids to protect their delicate skin. When our kids were tiny, we learned to trust JOHNSON’S® Baby products for their sensitive skin. As they’ve grown, we still use gentle JOHNSON’S for their night time ritual to keep their skin soft and healthy looking. Tip! For travel and extra busy days, we keep JOHNSON’S® HEAD-TO-TOE™ washcloths handy. They’re perfect for quickly cleaning their skin, and anywhere else they need a wipe down before bed. On an average day, we love JOHNSON’S® HEAD-TO-TOE™ Baby Wash to keep their skin clean, and use JOHNSON’S® BEDTIME® baby lotion in the driest months of the year. They’re perfect for washing their face on busy days, and lovely on days we all have more time for a shower or bath as well. For nights when our daughter wants to soak in the tub, she uses just a touch of JOHNSON’S® HEAD-TO-TOE™ Baby Wash.
You can pick up any of these great JOHNSON’S® products at Walmart. Our dentist did gave us one great tip: buy a kid’s size electric toothbrush. Since we got the kids electric toothbrushes (they cost less than $20, and have removable brush heads), the kids like brushing more, and they brush longer. Win! Cozy, soft pajamas are crucial. After all, it’s pretty hard to sleep in scratchy, constricting clothes! Our littlest, now nine, is incredibly picky about labels in any of her clothes, and fabrics, especially. Cotton and fleece work best for us. Since no parent, ever, has enjoyed being woken up at 3:00 am to the tune of “I wet my sheets“, we’ve have a rule that the kids need to go to the toilet before bedtime. We tell them it’s a household rule, and that we parents have to go to the washroom before bed as well. It is kindof funny to have your little one remind you to pee if you sneak off to bed early on Dad’s night to tuck them in! We’ve read to or with our kids since they were babes in arms. It’s worked out well, too, since now the’re voracious readers who will sit down with a book for hours. Some days we even need to remind them to stop reading and come up for air or grab a snack! Since we let the kids read in bed, there’s no hassle with trying to wrangle them into their beds here. We just close the book, cuddle up to them for a minute or two (though our twelve year old is also likely to drift off by himself), and go to sleep. Well, it’s pretty much chaos. Just kidding… sort of. The truth is that both hubby and I are not morning people, so our morning routine is considered successful if we get the kids to school on time. We get up, brush our teeth, get dressed, grab breakfast, and go! Lunches are either made by the kids the night before, or one of us adults in the morning. What’s your bedtime routine? We’d love to hear!